Using the Herschel Space Observatory, scientists gathered new data on the asteroid Apophis, an asteroid that will make a recording setting close approach to Earth and was initially given a 2.7 percent chance of impacting Earth in 2029. Pasadena, California – Scientists using the Herschel Space Observatory made new observations of asteroid Apophis as it approached Earth this past weekend. 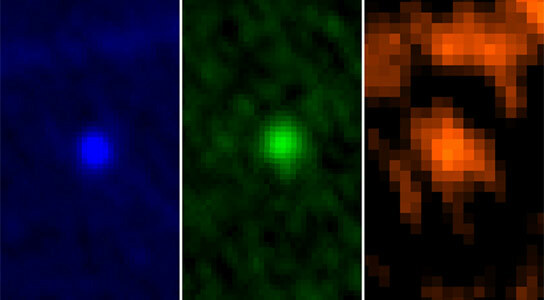 The data show the asteroid to be bigger than first estimated, and less reflective. Discovered in 2004, Apophis was initially thought to have a 2.7 percent chance of impacting Earth in 2029. Additional observations of the asteroid ruled out any possibility of an impact in 2029. However, Apophis is expected to make a record-setting — but harmless — close approach to Earth on April 13, 2029, when it comes no closer than 18,300 miles (29,450 kilometers) above Earth’s surface. The asteroid will make another approach to Earth in 2036. Data collected by telescopes during today’s close approach are expected to refine the asteroid’s orbit to the point where an impact in 2036 can be ruled out. Over the weekend, Herschel gathered data while observing Apophis for about two hours on its approach to Earth, ahead of today’s closest encounter at a little less than one-tenth of the distance from Earth to the sun: about 9 million miles (14.5 million kilometers). 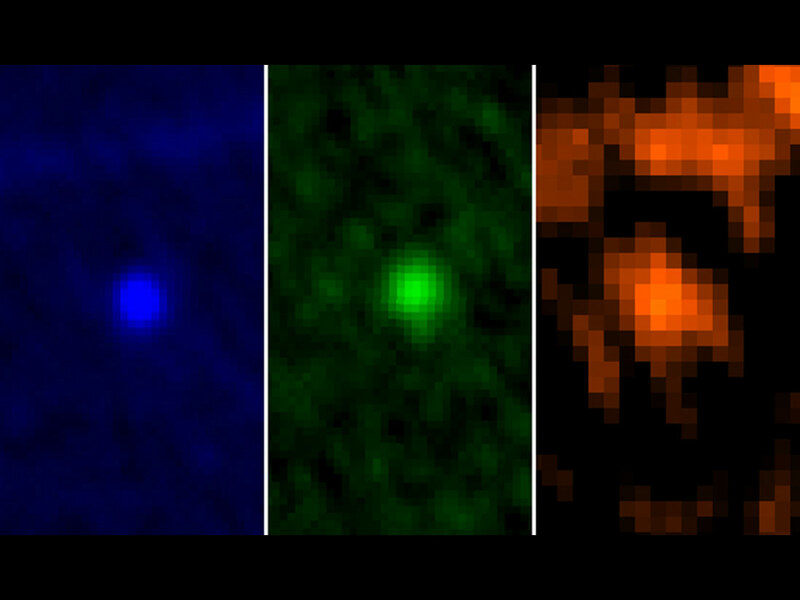 The space observatory provided the first thermal infrared observations of Apophis at different wavelengths, which together with optical measurements helped refine estimates of the asteroid’s properties. Previous estimates bracketed the asteroid’s average diameter at about 885 feet (270 meters). Herschel’s observations indicate the space rock is about 1,060 feet (325 meters) across. By analyzing the heat emitted by Apophis, Herschel also provided a new estimate of the asteroid’s albedo — a measure of its reflectivity– of 0.23. This value means that 23 percent of the sunlight falling onto the asteroid is reflected; the rest is absorbed and heats up the asteroid. The previous albedo estimate for Apophis was 0.33. Herschel is a European Space Agency cornerstone mission, with science instruments provided by consortia of European institutes and with important participation by NASA. NASA’s Herschel Project Office is based at NASA’s Jet Propulsion Laboratory, Pasadena, Calif., which contributed mission-enabling technology for two of Herschel’s three science instruments. The NASA Herschel Science Center, part of the Infrared Processing and Analysis Center at Caltech, supports the United States astronomical community. More information is online at: http://www.herschel.caltech.edu , http://www.nasa.gov/herschel , and http://www.esa.int/SPECIALS/Herschel/index.html . 2 Comments on "Asteroid Apophis Will Make a Record Setting Close Approach to Earth"
Can’t we just like hike any asteroid for a free ride around the solar system for many scientific pursuits even for tracking purposes. Thank you for presenting an explanation of the data in a clear and concise manner for us layman. I was an engineer for 25 years and find it somewhat unsettling that the percentages stated in NASA’s and this article concerning close approach orbits are accurate within less than five percent(5%). I studied both Physics and Chemistry with labs and of course performed tightly controlled, laboratory experiments. My professors in both subjects unequivocally stated, that in industry, if a scientist attained a five percent (5%) accuracy it was considered outstanding, therefore, the 2.7% accuracy stated makes me somewhat suspicious. I was taught, that when presenting your data, you cannot use decimals places beyond the accuracy of your measuring instruments. NASA presents data up to ten (10) decimal places? These are uncontrolled, astronomical distances measurements with infinite possibilities for error!